The Ninja coffee bar offers coffee aficionados the chance to make custom coffee shop coffee drinks at home, but with all of the great coffee makers out there, how does the Ninja stack up? or a specialty brewed iced coffee with enough intensity to stay flavorful as it melts the ice. Additionally, iced coffee fans may appreciate the iced brewing carafe, so that they can serve fresh iced coffee to guests and family members. Counter space is important! No matter how big your kitchen is, having too many appliances on your counter makes the space look cluttered and messy. If you're a fan of dark, rich coffee but your spouse starts the day with a straight up cafe americano, you're either dealing with two coffee pots in your space or multiple roasts, grinds and blends of coffee in your cupboards. Or you could buy a Ninja coffee bar. Cafe Americano? No problem. Once the water reservoir is filled, just add your favorite ground coffee, choose the cup size and select Classic Brew. Do you need an extra jolt of flavor intensity to start your day off right? Once the coffee's added, brew yourself a large travel mug of Rich Brew. You will be ready for whatever the day can throw at you! easily clean up the frothing blades without having to clear the steam tube. avoid the mess that can come from milk reservoirs on coffeemakers. As previously stated, you can set your preferred flavor intensity with a simple turn of the dial. Options include both standard and rich brew. For deep coffee intensity, try the iced coffee setting. This brewing strength is designed to keep its flavor over melting ice. The water reservoir is removable for easy cleaning and descaling if necessary. You can also put the brewing process on hold to sneak a cup from the partially brewed carafe if time is of the essence. This machine takes a #4 cone filter, or you can rely on the reusable Ninja coffee bar filter. Once you're ready to add milk or flavorings to your coffee, be aware that the Ninja coffee bar frother is easily removed for fast, safe cleanup. If you run into problems, Ninja Coffee Bar Troubleshooting is fairly easy when using our guide. Additionally, whether you're staying home to linger over a pot of coffee or you need to get on the road, you can brew directly into a large travel cup or into the Ninja coffee bar glass carafe. Each Ninja coffee bar system includes a programmable coffee maker with Thermal Flavor Extraction Technology for your personal brew choice. Variances between the model numbers include whether or not the machine has a milk frother attachment and the inclusion of a travel mug or iced coffee cup. Depending on the unit you purchase, you'll enjoy a glass carafe for standard brewing, a carafe that tolerates the cold for iced coffees, and a permanent gold filter to save paying for paper cones. With this machine, you can make regular coffee, a more intense brew, and iced coffee with one machine from one great brand of ground coffee. If early morning is not the best time for you to be rummaging in the cupboard looking for the right coffee, this machine is ideal! The Ninja coffee bar can make one cup or a full carafe, no matter how full the water reservoir is. If you've got a small household and need to brew and run, that water reservoir can save you a lot of fuss. Fans of entertaining can treat their guests to a freshly whipped coffee drink with a touch of sweet syrup. The blending tool attaches to the side of the Ninja Coffee Bar and is easily detached for cleaning. Plus, you can enjoy a delicious coffee treat without the risk of steam tubes or coffee under pressure! The iced coffee setting is crucial for summer treats. This setting is designed to stand up to melting ice. Be prepared for an intense flavor, and enjoy! No Ninja coffee bar review would be complete without pointing out that this machine can't make espresso, which requires pressure. However, the Thermal Flavor Extraction Technology brews your coffee under extreme heat and makes a lush, dark cup of intensely flavored coffee. As previously state, if espresso is your thing, this machine may not work for you. This tool doesn't brew under pressure. While the flavor intensity can approach the richness of espresso, you won't get the crema you're accustomed to from the Ninja. However, you can enjoy a similar rich, dark flavor of Ninja coffee bar espresso from the iced coffee setting. 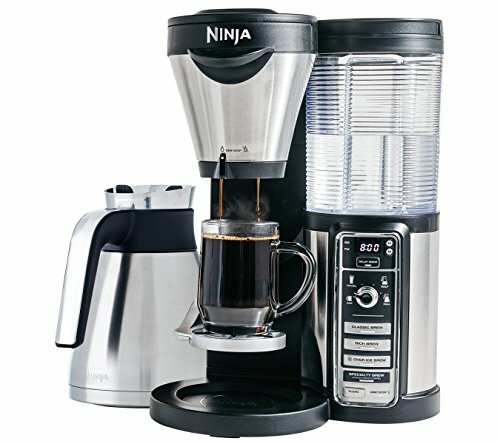 When considering a Ninja Coffee Bar vs Keurig purchase, be aware that the Ninja can't provide the specialty non-coffee drinks such as hot cocoa or hot cider, as you can enjoy in the Keurig. However, multiple coffee flavors are possible with the Ninja. As relates to the K﻿﻿eu﻿﻿rig, if pod coffee is important to you, be aware that the Ninja does have a gold tone permanent filter in the latest product design. There are no pods for the Ninja. Fans of a regular cup of coffee and fans of specialty coffee beverages can make great use of the Ninja Coffee Bar. Thanks to the Sofia Vergara inspired recipes included with the Ninja model 2035244, you can enjoy multiple brews and blends of coffee, hot or iced. There are 2 things that stand out to us the most that may influence your decision. The lack of true espresso creation and lack of flexibility and ease of use compared to a Keurig. What do you think about the Ninja Coffee Bar? Is it just a another gimmicky coffee maker? Let us know in the comments with your thoughts and experiences.